It's a miracle--for the first time ever, I am actually feeling well enough to travel during my second trimester. I am so grateful!! This little "babymoon" of sorts is about the most fun I've had in some time. I can honestly say it was worth the spending hiatus that was the past 7 months. Deciding to not spend money on birthdays, our tenth anniversary, Christmas, or Valentine's Day was one of the best decisions we've made. Skipping all the hype and opting for plane tickets instead is totally rocking my world this week. 1- Blue skies and warm weather in Paris...rare and very much appreciated on that first day. 3- Finishing up yummy ice cream from Berthillon along the Seine. 4- The backside of Notre Dame. How nice would it be to live in one of those apartments across the street and enjoy the sights and the bells constantly? 5- Papier Plus...such a simple, beautiful and colorful place to be (and so close to Ebouillante!). 6- Hats. I love that there were several women inside this shop and that women in Paris still don hats. I wish I could get away with a fun, feminine tradition like that. 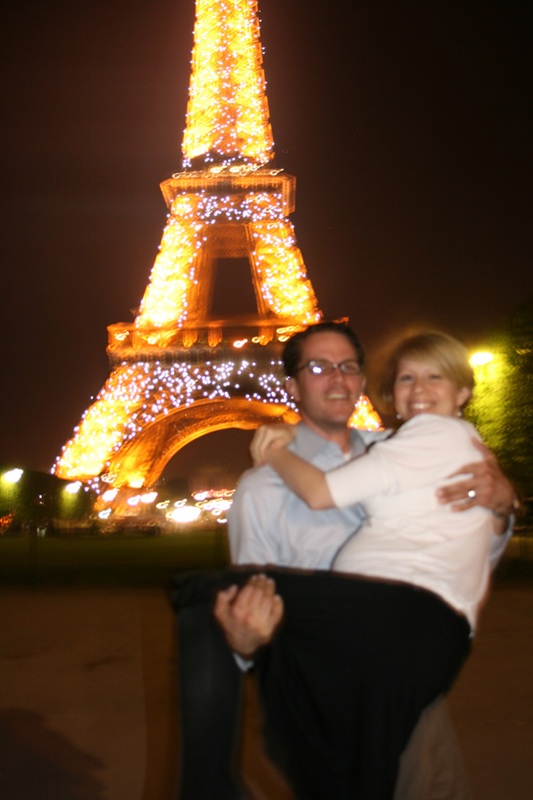 7- Did you know the Eiffel Tower sparkles at midnight? It really goes nuts and it's super fun to see if you're still out and about at such an hour! A major advantage to vacationing with friends is always having someone there to take pictures of you and your honey and we are most certainly taking advantage of this situation! How fun! What a great idea! I think I need some sort of goal like that to go on a spending hiatus. No "babymoon" in our future but a fab trip for our 15th anniversary next year sounds like a good one! Looks so fun. I'm so jealous! If you're looking for a romantic dinner...eat at Le Divellec. Most amazing food. You won't be disappointed. The chef there invented a machine called "the lobster press" that makes the most exquisite lobster. Try it! So glad you are feeling better. You look great! Glad you're feeling well. Pregnancy is the worst. Luckily, it gives you a pretty fabulous reward in the end. :) And yes, the Eiffel Tower is stunning a minuit. I feel the same about hats. Oh I am so happy to see these pictures! It looks like Paris was absolutely wonderful. Robby and I experienced the same "twinkling" with the Eiffel Tower at midnight. Very magical! this looks like a PERFECT trip and you look stunning!!!! OMG, how did I miss that you are pregnant again?! How did this happen? In any way, congrats and have a wonderful time in Paris!! Enjoy the time together. Oh, this makes my heart ache a little. Glad you get to enjoy it. When we were there the twinkling was every hour and we could peek out our window to see it. Sigh. If we are good, when we die we go to Paris right? Have fun! Well congratulations on your fabulous getaway! Here's hoping Days 2 and 3 and... well ALL of them!... are simply wonderful and relaxing. Thanks for taking the time to share a few thoughts and pics. Lovely! What a wonderful idea to take a babymoon. Paris looks dreamy. Anderson: it was hardly on a whim :) We planned it for a couple of months and let's just say it was a bit harried down to the last minute thanks to that darned volcano and childcare issues! We didn't even know if we were going to make it the day before we were scheduled to leave. Crazy. Thankfully it worked out...my heart would've sunk.